Well last month was such a busy month testing all manor of things now it was time to put them into practice. 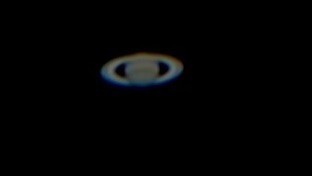 I was having a chat with my friend John when he said that he was at a BBQ the other day at some friends and from their garden he could see Saturn rising in the South-East - this surprised me because I knew Saturn was on its way but I didn't realise it was visible already! The next day was cloudy but I checked the Astro Panel app on my Android phone (I really recommend this) and it said the cloud will clear by 21:00 and there will be clear skies - I didn't really believe it but hay if it was I'd be ready to seize the opportunity - now I knew that there was no way I would be able to see Saturn from my drive or my garden due to the trees so it was time for my first "Field" trip. Near to where I live are some reclaimed marshes that have been used for farm land for many years. Last month I'd written to the farmer asking him permission to use his land for astronomy, he kindly agreed and issues me with a key for a small fee and informed me which gate and track to use to gain access to the large concrete pad that a few Essex/London Astronomy Clubs use for meets and the sea wall beyond as the sky is so dark out there. I made sure everything was charged the night before and then packed the car ready for the off. I arrived at the end of the farm track and parked on the concrete pad about 21:30 and the skies were pretty dark :o). I levelled then polar aligned my mount (I still have trouble polar aligning mainly because every article/app I read/use tells me something different - I'll try and cover this later in the month). 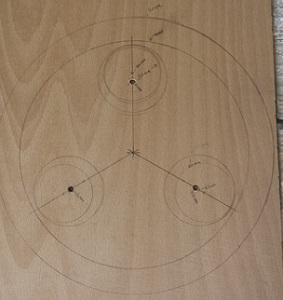 Then I attached my recently made scope cooler and then did a three star alignment using SynScan - the alignment was a little off as I might not have found Polaris in the polar scope but as I was planet hunting it didn't really matter too much. Now I'm 6ft 5in and for some reason today I'd decided to extend the legs, this in hind sight was rather silly because I now had to stand on a box to see through the eyepiece, Doh! I probably should have shortened the legs and started again but I thought I'd plough on! It was actually a little gusty out here and when I checked Astro Panel I saw the wind speed was force 3 (3.4-8m/s - moderate) so I positioned the car with the boot open to block as much wind as possible. 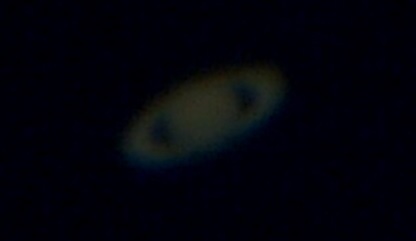 I set up the laptop and opened Stellarium to find that indeed Saturn was visible to the South-East I slewed the scope over to Saturn's position and popped in a 25mm eyepiece. Wow there she was in all her glory, in my opinion a truly magical site! 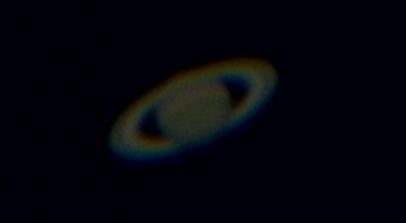 I gazed at Saturn for a while changing eyepieces and Barlows to get in as close as I could. 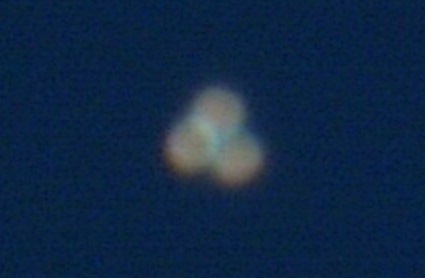 I tried Double stacking Barlows without much luck as the breeze kept the scope moving. 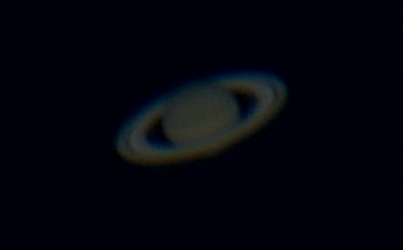 After looking at Saturn for a while I thought I'd try and capture her, so I got out my SPC900NC and attached it to the focuser - at this point I had both Barlows but as you can see the image is very blurry due to the movement of the scope in the breeze but after processing I was rather surprised! I removed one of the Barlows and imaged again and after processing I was amazed at the results you can even make out the Cassini Division (the gap between the rings). Imagine how good this would have been if there was no wind! 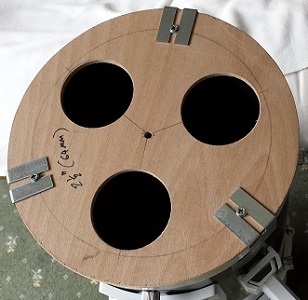 I did struggle a little to gain focus with the movement of the scope, I did try my Bahtinov mask but due to the size of the planet through the focuser it didn't work so well, I'd have to make a Hartmann mask like my mate John to help me focus in on larger objects. I also noticed at this point that my focus motor was not sitting in line with the focuser, I'll have to have a look at this in the coming days. 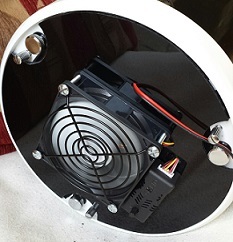 As mentioned earlier I used my primary mirror cooler that I made last month and it worked really well, it was a little hard to tell with the breeze but 20-30 seconds after I turned it off the image got a little fuzzy, like I said it was a bit hard to tell but I'm convinced it's removing the boundary layer and working well! A couple of days after my "Field Trip" I found a small piece of 6mm ply and ding, just what I needed to make a Hartmann mask. After 30 mins or so in the garage hay presto my very own Hartmann mask. I also had the idea to see if I could power my laptop from my 12v power supply only in an emergency in case the battery died when I was still imaging. I found out a spare power supply and ordered a 12v plug and a 3 way 12v socket and with a bit of soldering it was finished. 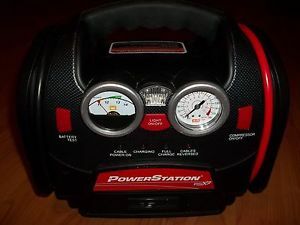 It was going to be hit or miss whether it works or not because my laptop requires 15v 5A and I only have a 12v power supply but when I plugged it in it worked with one exception, the charging light on the laptop was off but that's ok I'm not worried about charging it just keeping it alive until I've finished. The next time i managed to get out this month was on the 15th and it was a little late when i got out the house, it was about 22:50 before i got setup mainly due to the fact i had trouble finding Polaris through the polar scope. i could see loads of bright stars but i just couldn't find Polaris - a simple task i know! I managed to get some good images of Saturn using my newly cooled SPC900NC and my Hartmann mask, you can clearly see the Cassini Division in both images. 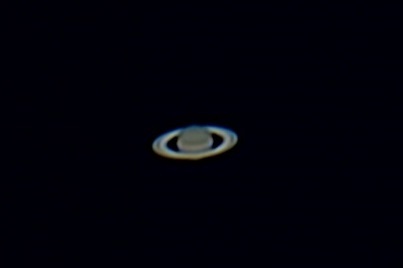 You can also see the smaller Saturn image is clearer than the one above taken a few nights before with out the use of a Hartmann mask. 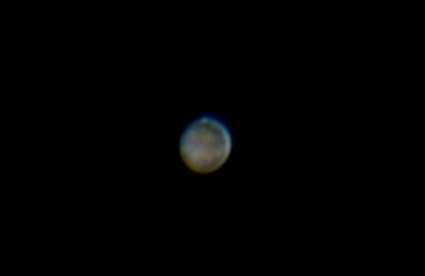 Then I slewed over to Mars and again used the Hartmann mask to find focus but I found that I was getting a little vibration on the image so i turned off then fan and Mars was really clear. The fist image is out of focus looking through the Hartmann mask to show how it works. 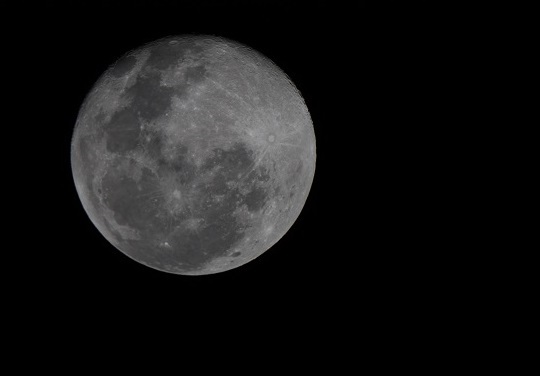 After imaging the planets i decided to get my Canon EOS 450D out and get some images of the Moon and galaxies. 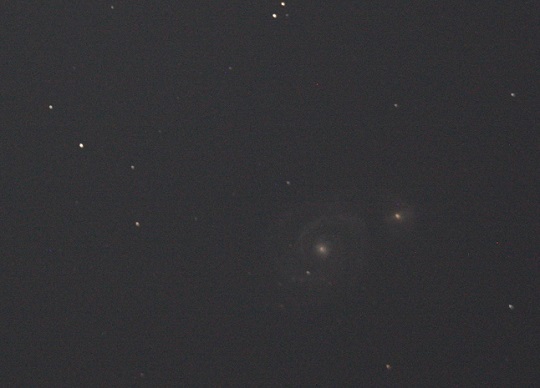 Below are my captures of the Whirlpool Galaxy M51a and M51b it's companion galaxy and the Moon again focused through my Hartmann mask. I also managed to get out the next night with a friend of mine who is really interested in astronomy but has yet to get a scope. We got out a bit early - about 21:00 - this way Polaris would be bright and i would easily pick it up. I was fully polar aligned but 21:30 and ready for the light to drop. As Mills was with me when it got darker i decided to do him a little tour of the visible planets, first Jupiter then Mars and then Saturn, he was so impressed i think he's now hooked and will be looking for a beginners scope soon. 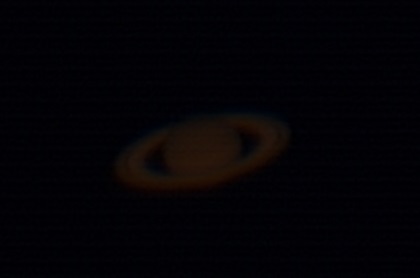 I popped the SPC900NC into the focuser and tried to image Saturn so Mills had something to remember the night but the imaging wasn't great and we only managed one orange coloured fuzzy image due to the conditions and about 23:00 the clouds started to come over and we eventually lost any visibility. To be honest this probably helped me a little due to the late one the night before, so we packed up and headed home.